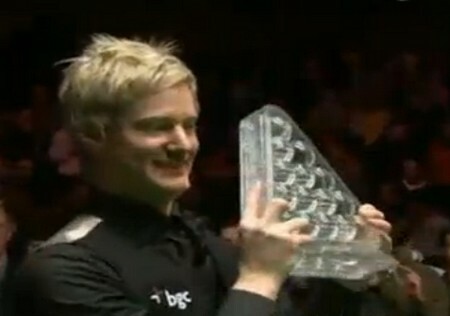 Neil Robertson is the Masters 2012 Champion! In a battle of former world champions it was the left handed Robertson who also made history by becoming the first Australian to with the prestigious event. Robertson and Murphy, who were meeting for the twelfth time in their professional careers had both shown impressive form in reaching the final, Robertson, who had seen off Mark Allen, Mark Williams and Judd Trump was facing a man who had overcome Martin Gould, Mark Selby and John Higgins. Murphy looked in prime position to take the opening frame as he led 57-29 only to to leave Robertson a chance to counter when he left the final red just off the top cushion to the corner. Drilling it in Robertson swung the cue ball all around the angles to land on the brown and cleared up to and including the blue. The pink was just off the side cushion and far from simple. As Neil missed it to the corner so came a safety battle. As they fought for the initiative it was Murphy who was to make the defining mistake as he left a long pink to the corner. Taking it Robertson knocked it in and followed it with the black. But Murphy was far from downhearted as he rifled in a 65 to level at 1-1 and then went 2-1 up as he capitalised on a safety mistake from Robertson who left a red available to the corner. There was to be no mistake from the Englishman as he compiled a 108. But Robertson was to answer his challenge in emphatic fashion, as he sunk a delicate red to the corner and rolled in a 103 clearance to level at 2-2 at the mid session interval. Resuming Robertson upped the pressure by taking the fifth frame. He also had chances to lead 4-2, and but for a missed pink to the corner he would surely have done so. Murphy though wasn't going to pass up an inviting looking table and a 53 was enough for him to level at 3-3. Robertson though defied the odds to make a frame winning 72 with the colours awkwardly placed. The Australian restricted to the pink and the green. And with just one frame left of the afternoon session Robertson was in the position of either having a 5-3 lead or all square at 4-4. In a frame that swung like a pendulum it was Murphy who looked likely to capture it before a missed red to the yellow pocket on 46 sent him back to seat. Robertson countered with 60 only to miss the blue to the centre with just the colours left. While Murphy claimed the yellow he was unable to add the green with a delicate shot to its pocket. The issue was finally settled when Robertson forced a mistake from Shaun who left the green to the centre. This time there was to be no reprieve as Neil cleared to the pink to hold a 5-3 lead at the end of the session. Resuming Murphy ran in a 49 to trim his deficit to just one frame. He should have also levelled when ramming in a long red from baulk for 32. But then a costly error of leaving a red close to the corner pocket signalled his undoing as Robertson clipped it in and dispatched a break of 101 to stretch his lead to 6-4. 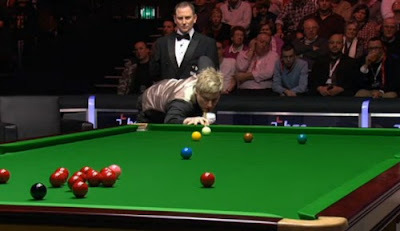 Robertson did the initial damage in frame eleven with a 35, but then a tactical exchange, punctuated by some solo pots and mistakes from both players left the frame in the balance. 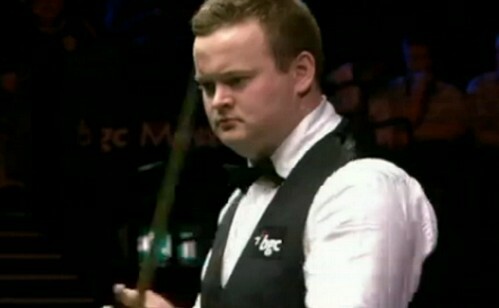 It was to be settled though when Murphy hit the black in trying to contact a length of the table final red. That red was all that was needed for Robertson who now had a commanding 7-4 advantage. And Murphy was soon in deeper trouble at 8-4 when Robertson, cueing from the jaws of the corner pocket rolled in a red to the centre and wasted no time in getting the black on its spot. The balls in emminently pottable positions were waiting to be knocked in and Robertson duly obliged with a 76. Robertson was now unstoppable. A plant red to the corner put him in ideal position and the Aussie was in business, Striding confidently round the table Neil knocked in a 76 to put himself one frame from glory. To Shaun's credit he dug deep to dominate the thirteenth frame with runs of 33 and 52 and reduce his arrears to 5-9. A courageous blue, taken to the yellow pocket together with the screwback to the reds was enough to propel Shaun to a 86. All of a sudden that six frame deficit had been halved and Robertson's lead was now 9-6. But any thoughts of Shaun had of sustaining his comeback were swiftly blown away by Robertson just minutes later. Lining up a long straight red from the baulkline he stroked it in and after banging in the blue for 26 smashed into the pack via the pink. To roars from the audience the red parted perfectly and on 56 powered in the black and split the line of reds below the pink. As those reds parted his eyes flicked towards the centre pocket where a red was rolling to. To Neil's relief - it stayed out and the Australian soon had 70 break before breaking down on a red with the rest. 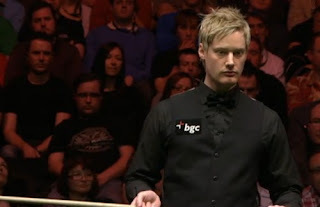 Shaun needed a snooker and he was not to find it as Robertson finally clinched the title with a long red. The look on Neil's face said it all as he punched the air with both fists. Visibly enjoying the moment Neil proceeded to knock the last few balls of the final before missing. Shaun walked towards him with a warm handshake, and then enter stage right Neil's toddler son Alexander who was soon in his father's arms. It had been a great final with exemplary sportsmanship from both competitors. A certain other trophy in the shape of an urn may belong to England at the moment but this Ashes battle saw the Masters trophy head down under. Brilliant report. Susan Jardine is worthy and deserving of a presenter's job.